Full HD multi-coated optics lens with excellent light transmittance reach up to 99.5% and brightness. Environmental protection rubber body, durable as well as good-looking and comfortable hand feeling. The objective lens and eyepiece are equipped with dust cover to protect the lenses. The tripod can be used with this monocular, making it more stable to observe birds or other things in outside. The prism monocular is more convenient to use for connecting your cell phone with phone holder. Suitable for camping, fishing, hiking, sporting events, concerts, bird watching and traveling etc. Low Night Vision, can be used for night vision with some light but not for the completely dark night. Do not use the monocular to watch the sun directly, which may damage your eyes seriously. Please put the monocular in a dry place if you do not use in long-term. Do not use a wet cloth to rub the lens, use dry and clean cloth (included) to rub slightly. HIGH POWER FOCUS MONOCULAR: With 40x magnification and 45mm objective lens, you can see 10X closer with a clearer and brighter image, enjoy the beauty of the distance, and you will gain an amazing viewing experience. EASY TO USE: With the compact pocketed size, this mini monocular is easy to use by single hand. You can just slip in your pocket and bring along wherever you go. Adjust new larger One-Hand Focus Wheel easily, you can get high definition image easily. Wireless Camera Shutter Remote Control for cell phones. Compatible with iPhone, Samsung, LG, Sony and almost all other smartphones on the market. COMFORTABLE CONVENIENT: This monocular telescope includes hand strap and carries case which makes easy to carry around during traveling or other outdoor activities. 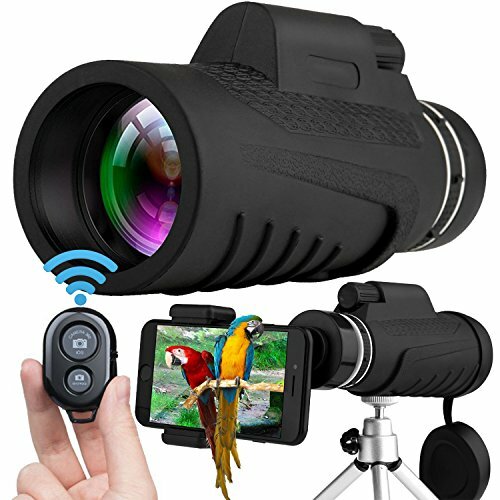 There has a tripod connector at the bottom of monocular offers steady viewing when connecting a monocular tripod. If you have any questions about this product by Tysonir, contact us by completing and submitting the form below. If you are looking for a specif part number, please include it with your message.